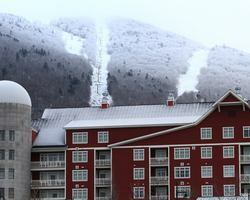 Tours de Sport Hot Deals: Get your 4th Midweek Night FREE at Clay Brook at Sugarbush! Get your 4th Midweek Night FREE at Clay Brook at Sugarbush! Our friends Lee, Jen & Devin at Sugarbush have a great Spring deal for you! Get your 4th midweek night FREE at the "Bush's" flagship property! The closest to the slopes you can get, located just steps from the lifts. From hotel-style rooms up to five bedroom condos, the luxury accommodations of Clay Brook are the finest the resort has to offer. Each unit is tastefully appointed down to the smallest detail. You will find hardwood furniture, custom cabinetry, stainless steel appliances and granite countertops. Full valet and concierge service is at your beck and call. Outdoor heated pool and hot tubs for year round enjoyment. Timbers Restaurant offers up three meals and daily apres ski menu. All studios and condominium-style units feature a fully-equipped kitchen and fireplace. Lodging amenities include underground parking and 24-hour valet sservices, personal concierge, boot warming and ski valet services, as well as an outdoor heated pool and hot tubs, fitness room. Based on available inventory at time of booking. SPECIAL BONUS: For a limited time, get extra value with $50 per day midweek adult tickets! If you prefer, contact your sales representative for assistance & additional details at 888-754-2167. Please go to the Sugarbush Ski Vacation page to start your custom trip quote to Sugarbush to take advantage of this Hot Deal!